Pokerism et al: UFC 118: Frankie Edgar vs BJ Penn Again! On UFC 112: Invincible, BJ Penn and Frankie Edgar slugged it out for the full five rounds in a UFC Lightweight Championship bout. Eventually, it was contender Frankie Edgar who was given a unanimous decision win over BJ Penn, which saw BJ Penn lose his UFC lightweight championship belt. It was heartbreaking for BJ Penn, who was considered a big favorite to win and defend his title. But then, that's all in the past now - and all there is left to do is to look forward for the rematch which comes in UFC 118. UFC 118 will feature several interesting fights, but the main event will be the rematch of Frankie Edgar vs BJ Penn, but this time it will be Frankie Edgar looking to defend his title against the challenger BJ Penn. Frank Edgar has a very impressive 12-1 MMA record, and his only loss was an upset unanimous decision against Gray Maynard back in UFC Fight Night 13 in April 2008. Since then, Frank Edgar has improved and become unstoppable, booking huge wins against popular lightweights like Hermes Franca, Sean Sherk, Matt Veach and of course BJ Penn. Frankie Edgar trains with the Renzo Gracie Combat Team and is proficient in boxing, wrestling and has a purple belt in Brazilian jiu-jitsu. Frank Edgar has booked Fight of The Night honors thrice in his illustrious career, and is capable of winning via TKO and submission. While most of his fights have gone the full distance and ended in a unanimous decision win, it just goes to show how Frank Edgar is conditioned to last the entire fight and find ways to win. BJ Penn is the more popular of the two fighters, and will probably be a name etched in the UFC Hall of Fame as a champion in the welterweight and lightweight divisions. BJ Penn has had 22 MMA fights in his career, fighting a who's-who in the world of mixed martial arts like Matt Hughes, Georges St. Pierre, Lyoto Machida, Kenny Florian, Diego Sanchez, Joe Stevenson, Renzo Gracie, Caol Uno and Jens Pulver to name a few. The loss to Frank Edgar may have come out as a fluke, and certainly BJ Penn is the kind of fighter who learns from his losses and trains 200% harder to bounce back and win. Personally, I'm a big fan of BJ "The Prodigy" Penn, and I would put big money for BJ Penn to win back his UFC Lightweight title from Frank Edgar on UFC 118. 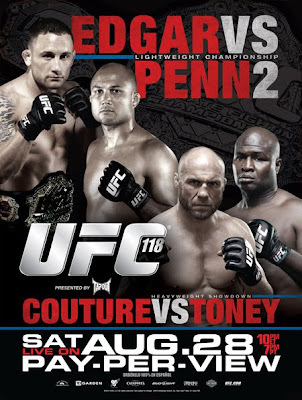 UFC 118 will be held on August 28, 2010 at the TD Garden in Boston, Massachussets. Other exciting matches lined up for UFC 118 include Randy Couture vs James Toney, Nate Marquardt vs Rosimar Palhares, Kenny Florian vs Gray Maynard, Nate Diaz vs Marcus Davis and many more.